In today's most demanding applications, liquid cooling has become the choice of designers striving to achieve the rising heat loads of high power electronics. Whether it's lasers, power generation and conditioning, medical equipment, transportation or military electronics, liquid cold plates offer performance advantages over air cooled solutions in high watt density applications. Darrah Electric is pleased to work with industry-leading manufacturer Wakefield Thermal Solutions to provide a large selection of liquid cold plate heat sinks for our customers. 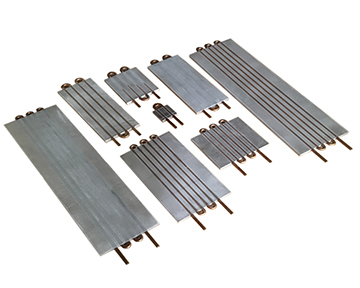 Our selection includes high contact cold plates, brazed blister cold plates, matched chill plates for single and three-phase power modules, etc. We provide both standard and custom designs.